Volko Supply... foundation crawl space ventilation... powered crawlspace fan... draft and ventilation solutions. Powered Crawlspace Vent (Model PCV1) creates a powered ventilation system for crawlspaces that can be utilized in both old and new construction. 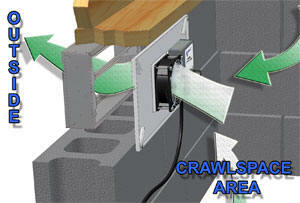 The PCV1 crawlspace fan is designed to be mounted behind any new or existing crawlspace vent. Its operation is controlled with a temperature switch /humidistat control which activates the motor at or above 50ºF and is user adjustable for the varying levels of relative humidity in your crawl space. A crawl space or crawl way is a low or narrow space, usually beneath the upper or lower story of a building, that gives workers access to plumbing or wiring equipment. By incorporating the PCV1 crawlspace fan into your homes crawl space ventilation system, you can help stop mold growth, mildew, rot, pest /insect infestation and decrease high humidity levels while increasing the overall airflow within your foundation. To aid natural crawlspace ventilation, mechanical ventilation should exchange the crawl space air at least four times an hour or every 15 minutes. Home with 1500 square foot crawl space 2 feet tall. Each Fan provides 110 CFM so one should use two(2) PCV1 crawlspace fans. National codes require 1 square foot of free area in the foundation for every 150 square feet of crawlspace area. Most homes do not meet the criteria. 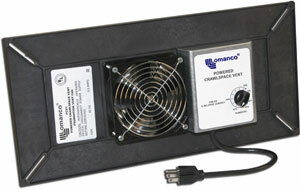 The Powered Crawlspace Vent will assist with the air movement in an under ventilated home by providing 110 CFM. The fan is controlled by a de-humidistat which will operate the fan if the relative humidity is above the set point. The fan also has a built in thermostat, which will shut the fan off if the temperature is below 40° F.
The fan will operate if the temperature is above 50° F and the dehumidistat is in the closed position. This unit has been preset at 60% RH. if the air is drier than the wood, moisture will migrate out of the wood. Outdoor lumber normally has an equilibrium moisture content (EMC) of 12-18%. When the EMC reaches 19 - 20%, decay can occur. This table lists EMCs for various temperatures and relative humidities (RH). When the temperature is 80°F and the RH is 60%, the EMC is 10.8 %. This unit has been preset at 60% RH; but, should be adjusted to accommodate local conditions. Need more power? Use our V2D dual fan 220 CFM model.